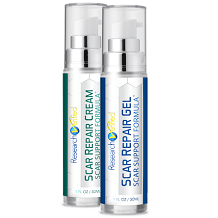 This Embrace Active Scar Defense review is going to take a closer look at the facts and information to learn more about how this scar treatment works and to see if it’s worth trying out for reduced scar appearance. The manufacturer claims that their product will relieve the natural tension that exists during the skin’s healing process which will effectively treat the primary culprit of scarring. They claim to be unique to other scar treatments because their product works by contracting and gently holding a closed incision together which actively relieves the skin’s natural tension. The only two ingredients in this product are silicon and medical-grade adhesive. Silicon is believed to heal scars by increasing the hydration of the stratum corneum which facilitates regulation of fibroblast production and reduces collagen production. It also balances the expression of growth factors which can make a scar protrude and more obvious. Silicon prevents scars from worsening by protecting the scarred tissue from bacteria. Bacteria has the ability to cause excessive production in the scar tissue. The manufacturer recommends washing your hands before applying and clipping any hairs in the effected area. Open the applicator and fold the sides and position the applicator over the scar. Once positioned, press and hold the applicator on your skin for thirty seconds. Continue holding the applicator firmly in place with your fingers along the visual guide strip then life the applicator from the skin. The dressing will remain in place over the scar. Each dressing lasts around ten days on average. For best results you should continue treatment for two months. You should not shower four hours after application or apply compression garments for 1-2 hours after application. This product is meant for scars that are healed and is not intended for open incision lines, injuries or abraded skin. Possible side effects include minor skin irritation, redness, allergic reaction, infection, pain or fever. You can purchase Embrace Active Scar Defense from third-party retailers and from Neodyne providers. We found one 30-day supply available online for $59.99. There are no bulk purchasing packages offered but that can vary according to the retailer you purchase from. Embrace offers a 90-day money-back guarantee only for products that are unopened, unused and have been purchase directly from Neodyne Biosciences. 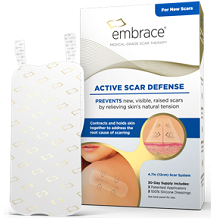 Embrace Active Scar Defense appears to be a promising scar treatment. It is unique to other scar treatments because it is designed to remain on the effected area for up to ten days and it is reassuring to see that this product is backed by a manufacturer’s guarantee. However, while the manufacturer does offer a guarantee, their policy is weak and limited. Their policy only applies to unopened products which means that if you purchase Embrace Active Scar Defense, try it and are unsatisfied in any way, you cannot get your money back from the manufacturer. Furthermore, the price is expensive relative to most other scar treatments we have seen on the market, but it appears that you do not get what you are paying for. The consumer feedback we saw claimed that this supplement did nothing to improve the appearance of their scars. With so many scar treatments available on the market, you are better off choosing one that is backed by a strong manufacturer’s guarantee for consumer protection and one that has been shown to be effective.